First ultra modern movie in malayalam, salute to Lijo Jose Pellissery for made this happen in such a small film industry like malayalam. An experimental movie which is full of varieties and colours in storytelling. ‘Double Barrel’ is a hollywood cowboy kind of movie. The creative level of the movie is outstanding. And the budget of the movie is about Rs. 16 Crores*. With Prithviraj, Arya and Indrajith, this multi-starrer comedy thriller also has Asif Ali, Swati Reddy, Isha Sharvani, Sunny Wayne, Vijay Babu, Manu, Chemban Vinod, Pearle Maaney, Sabu Abu Samad and Rachana Narayanankutty in pivotal roles. 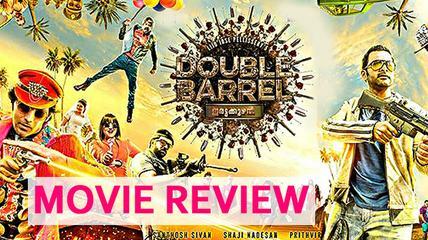 Prithviraj had earlier warned his fans that the "Double Barrel" is a "genre bender" in Malayalam films. Double Barrel is the story of a few gangsters set in Goa. The movie gets the old retro look in new terms and the lead cast including Prithvi Raj, Arya and Indrajith give impressive performances. The movie also has Isha Sarvani and Swathi Reddy as the female leads who have done a good job in the movie. As the director of the movie says that watching Double Barrel is like reading a comic book. Abhinandan Ramanujan’s cinematography, Prashant Pillai’s Music and Lijo Jose Pellissery’s Direction is the highlight of the movie. Music had a different feel it was too good done by Prashant Pillai . The movie is produced by Prithviraj, Santhosh Sivan, Arya, Shaji Nadesan, under the banner of August Cinemas. And the movie is distributed by August Cinema, E4Events & Nanma International (Asia Pacific). For every experimental movie lovers Double Barrel is a must watch and worthy one. It has the assembled cast, some spectacular performances and a new age story to offer. But some of the audience will not entertain this kind of movie. So literally Double barrel is an average flick. But it collects a huge amount in box office for sure. As it released on August 28, Tiruvonam day. So the first day collection might be little low. But hope coming days will make more business.